History: This 80 acre property on County X was the sight of the John and Rose Moeller farm. Their children were Margrette, Laverne, and Eileen. Eileen Moeller had a vision to have future generations enjoy this property. She saw the beauty of the nature around her and wished to share it with all. Eileen, life long resident, school teacher, farmer, and public servant --as a member of the U.S. Postal Service—realized how much this farm had meant to her during her lifetime. When illness no longer allowed her to live at her family home, she decided to gift the property to the town for a park. Upon her passing in 2005, transfer of the land was given to the town. In late 2005, the town set up a park commission which set goals to improve this land for public use while trying to keep it in a natural state. Of course, returning the entire park back into a natural area will take some time. We invite you to enjoy the progress in the meantime. Local community members, visitors, and many clubs and organizations have contributed time, money and talent to make this park what it has become today. We thank all of them for everything they have done. Information: Moeller Ridge Nature Park is open from dawn to dusk 365 days a year. The restrooms are open from spring until fall. Overnight camping is allowed by contacting the town clerk at 920-833-1377. The pavilion is available to rent for $25/day with a $25 security deposit. There are beautiful walking trails, picnic tables, benches and playground equipment for everyone to enjoy. Please no motorized vehicles except on the gravel parking lot. 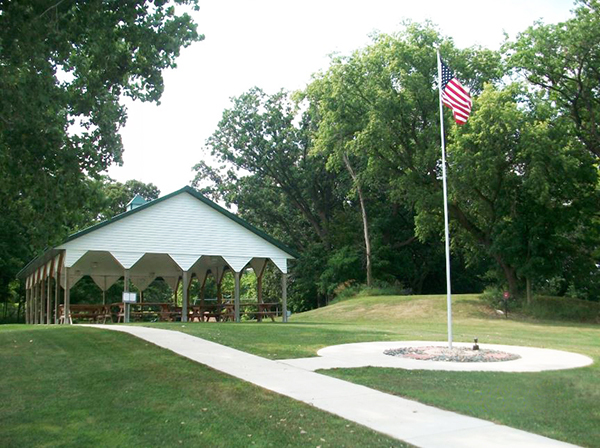 Donations: If you would like to make a monetary donation for use at the park, you may send a check payable to the "Town of Lessor Moeller Ridge Nature Park" to our town treasurer, Lisa Clauss, at W2846 Hofa Park Road, Pulaski, WI 54162. Please indicate Park Donation in the memo section of your check.